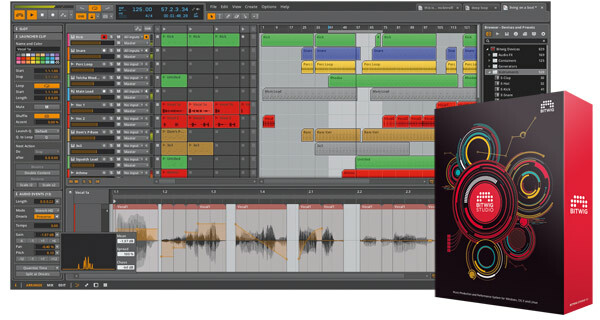 Bitwig Studio : is a multi-platform music-creation system for production, remixing and performance with a focus on flexible editing tools and a super-fast workflow. Bitwig Studio has been designed to take some of the best aspects from music software tools of past and present and combine them to create a next-generation music production and performance platform. The line between production and performance has become blurred in the past decade thanks to innovative software environments that allow you to do both, and performance-oriented features have become an essential part of many musicians’ production workflow. Bitwig Studio takes this “performance DAW” concept to another level–it’s a music production environment that allows you to assemble your music thru real-time performance. An alternative view of the clip launcher aligned with the mixer, optimised for live performance. Audio clips can consist of multiple audio events and feature Bitwig's own time stretching and transient detection. Split and rearrange audio events automatically, based on transient detection, and utilise the same parameter histograms and clip/track-based editing as with instrument clips. Bitwig Studio includes versatile audio rendering functions that let you directly bounce any selected clip or time selection in place or to a new track, as well as giving you the option to automatically slice audio material to be used in the drum machine or sampler. Bitwig Studio offers flexible screen sets to take full advantage of your monitor configuration.